Mmm! 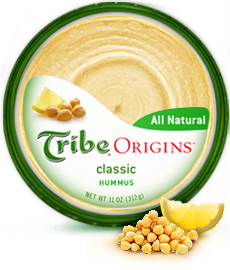 I love Tribe Origins Hummus! I have loved Hummus since I worked at Whole Foods. When your around all those healthy products you tend to try a little bit of everything. One day I grabbed some Hummus.. I never looked back! Forget chip dip! I received 3 coupons for free Tribe Hummus. This was my first time buying Tribe Origins, so the first time I went to the grocery store with my coupons I only got 1 tub. The first tub I got was the original. I took it home and pigged out! I paired the original Tribe Hummus with some delicious 34° crackers. The pairing was amazing. The Hummus was so perfectly blended.. The texture was so perfect! The original hummus is a simple chickpea and tahini blend. 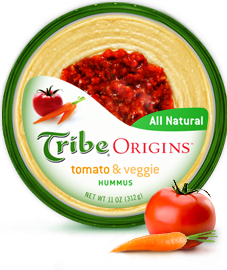 Everything in Tribe Origins Hummus is all natural, and has no artificial preservatives. My grandma is always talking about losing weight. I told her about hummus as an alternative to other dips and she was excited to give it a try. She liked the taste of the hummus, and the texture. Now every Tuesday when we watch The Biggest Loser we don't sit around eating chips and dip. Instead we snack on delicious Hummus and crackers and veggies. 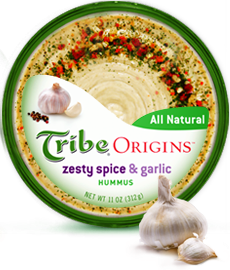 Next time I went to the store I had to get another Tribe Origins Original Hummus, because my other one somehow completely vanished.. (GRANDMA!!) I also went ahead and got the Zesty Spice and Garlic Flavor. I was a little cautious with this one. It looked absolutely delicious! The only problem that I had was the word Zesty. When I think of Zest I think of tang, like a lemon. But I think Zesty could also be another word for like, "Kinda spicy, but not too much." I started with a tiny little taste.. And thats all it took.. I loved it! With the little minced pieces.. It was like a flavor explosion in my mouth. I can't think of the right words to describe how amazing it tasted. But one word I can give you.. DELICIOUS! I am so glad I got the chance to try out Tribe Origins Hummus! I'm hooked for life! I LOVE IT! You know what Tribe Origins gets? Mandatory entry: Visit the Tribe Hummus Website and tell me what flavor you would most like to try. ﻿﻿Disclosure: Review product was provided to me free of charge to ensure and honest review. All opinions expressed are my own, and were not influenced in any way. Only 1 entry PER HOUSEHOLD. Be sure to leave your email address in each comment. Prize is being provided by Tribe Origins. I would love to try the Tomato and Veggie! Thanks for the review and giveaway! I'd like to try their Tomato and Veggie flavor! I'd love to try the Chunky Calamata Olive hummus! Chunky Calamata Olive sounds very yummy. would love to try it. I think zesty lemon sounds good! Tomato and Veggie flavor sounds delicious! my favorite has always been the roasted garlic! I voted for Luis! He's in first, I think, with 18% of the vote! I think the 40 spices sounds good. Roasted garlic sounds real good to me. Thanks for the wonderful giveaway. I would absolutely love to try the zesty spice and garlic hummus!! I love, love, love hummus! I can't decide between the Zesty Onion & Garlic or the Tomato & veggie! They both sound good! My first choice would be the Zesty Spice & Garlic. Thanks! I would love to try tomato and veggies ! Mmmm! I'd love to try the zesty spice and garlic flavor. Would love to try the 'Tomato & Veggie'. Thanks for the giveaway.